The north polar sand sea and the Acidalia Planitia (the large, dark region in the center) of Mars are primarily composed of glass. This story was updated at 8:50 p.m. ET. A meteorite that fell to Earth more than 40 years ago is helping scientists unlock clues regarding the makeup of Mars' atmosphere and its potential implications to help shape future missions to search for evidence of life on the Red Planet, a new study finds. At the center of the meteorite study is methane — the simplest organic molecule — which has had scientists scratching their heads over its presence on Mars ever since the gas was first discovered on the planet in 2003. To learn more about methane in Mars' atmosphere, researchers examined samples from the Murchison meteorite that fell over Murchison, Victoria, in Australia in September 1969. The study could offer valuable insights into the Red Planet's atmosphere, and could play an important role in the planning of future missions to search for life on Mars, the scientists said. The Murchison specimen is well-known for the organic material it contains, but it also has a similar composition to meteorites on Mars. As such, the scientists took particles of the space rock and showered them with ultraviolet radiationequivalent to sunlight on the Red Planet. According to the researchers, meteorites, which regularly bombard the surface of Mars, contain enough carbon compounds to generate and unleash methane gas when they are exposed to sunlight. In fact, the amount of methane from the meteorite particles was significant enough that it could account for an ample part of the methane measured in the Martian atmosphere. 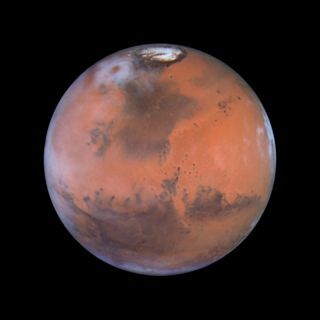 "Whether or not Mars is able to sustain life is not yet known, but future studies should take into account the role of sunlight and debris from meteorites in shaping the planet’s atmosphere," Andrew McLeod, a study team member from the University of Edinburgh's School of GeoSciences in Scotland, said in a statement. While other processes, such as volcanic activity, can produce methane without life, researchers have been keen to investigate whether methane gas on Mars is an indicator of life on the Red Planet. The detailed results of the study were published online today (May 30) in the journal Nature. The new findings come on the heels of a separate study published last week that looked into the organic molecules within meteorites originating from Mars. Researchers of the study examined 11 Martian meteorites, including the Tissint space rock that fell over the Moroccan desert in 2011. The scientists found that biological activity on the Red Planet could not have formed the organic materials encased within the Martian meteorites. This story was corrected to reflect that the Murchison meteorite crashed more than 40 years agoin the first paragraph.